Brazilian Blowout or Uberliss Keratin? Uberliss! Formaldehyde free!! Brazilian Blowout or Uberliss Keratin Treatment? 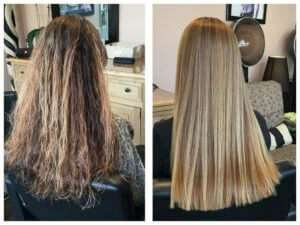 The Keratin Treatment I use is called Uberliss. It’s base is a glyoxylic acid that is an organic compound used specifically for it’s safety is this line. ONLY 2 Steps in these services – We reduced the number of steps to save you more time. Now you can fit more clients into your schedule. The Fiber Expander and Fiber Restructure now work synergistically to create a conditioning mesh that forms deep inside the hair cortex. No residual chemicals left on hair after treatment. Infused with Aloe Vera, providing extra protection for hair and scalp. A 100% Nano formulation. The ONLY keratin treatment manufactured at Nano scale. The results of smooth silky hair has been incredibly successful. If your worried about breakage, hair loss, your personal health or even poor results with the keratin treatment services you’re using, come see or talk to me about my services.